The UK's Advertising Standards Authority has ruled that EA's marketing for the free-to-play title failed to make clear how timing mechanics severely limited gameplay without in-app purchases. 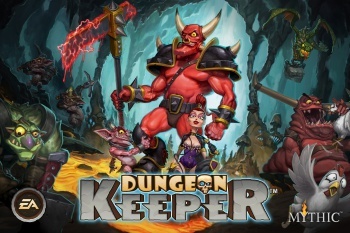 A complaint against Electronics Arts over its advertising for the free-to-play Dungeon Keeper mobile game has been upheld by the UK's independent advertising regulator, the Advertising Standards Authority. The complaint argued that an email marketing campaign that advertised the free game was misleading because it did not make clear that "gameplay was severely limited unless in-app purchases were made." The ASA has ruled that in future advertisements, EA must make clear the limits put on free gameplay and the role of in-app purchases in the game, particularly when it comes to speeding up gameplay. EA argued against the complaint, stating that players were not required to purchase the in-app currency Gems in order to progress, and that all players could earn Gems through in-game events. The ruling says, "[EA] stated that the average player would expect a free-to-play title to be monetised with countdown timers and premium currency [...] [EA] stated their belief that the mechanics of Dungeon Keeper were well within the average length and frequency for the market and that players of combat simulators would therefore reasonably expect them." EA also argued that the timers provided a sense of progression and resource management, and that even without the monetisation, the game will still have a timing mechanism. In the ruling, the ASA concludes, "The nature of the timer frequency and length in Dungeon Keeper, in combination with the way it was monetised, was likely to create a game experience for non-spenders that did not reflect their reasonable expectations from the content of the ad. Because the game had the potential to restrict gameplay beyond that which would be expected by consumers and the ad did not make this aspect of the role of in-app purchasing clear, we concluded that it was misleading." The contested ad described the game as free, but did not mention in-app purchases. Andrew Wilson, CEO of EA, told Eurogamer in an interview in June that the company "misjudged the economy" of Dungeon Keeper. "For new players, it was kind of a cool game," Wilson said. "For people who'd grown up playing Dungeon Keeper there was a disconnect there. In that aspect we didn't walk that line as well as we could have. And that's a shame." Players didn't feel they were getting value for their money in Dungeon Keeper, and Wilson admitted that, going forward, "value has to exist" for any business model. After this ruling, we can expect to see disclaimers at the bottom of ads for new free-to-play games, warning players that gameplay progression may be slow without in-app purchases, right beside the little "wireless charges may apply" warning that was included in the original EA ad.